Everglades Full of Giant Burmese Pythons? 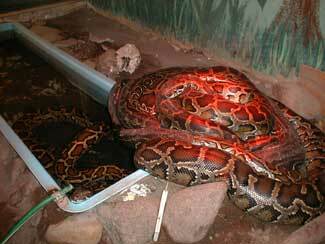 Burmese pythons, which are native to Southeast Asia, can be purchased legally in the United States. But many owners, especially so-called impulse buyers, tend to release them in places like the Everglades once they realize they can grow from just a foot to about 12 feet long in their first two years of life. It’s scary indeed, especially since one of the creatures was aggressive enough to try devouring a 6-foot alligator in the park last year. What keeps Snow up at night is the threat the prowling pythons pose to a delicate subtropical wildlife haven with a whole catalogue of rare or endangered native species. The pythons, with their razor-sharp teeth, have been eating practically everything that moves in the park, from small mammals to large wading birds, said Snow. The first Burmese pythons sighted in the park’s savanna and steamy swamps, back in the mid-1970s, are thought to have been pets. If irresponsible pet owners were the only source of the pythons invading Everglades National Park, Snow might not face such a daunting challenge. Compounding his eradication problems, however, is the fact that the bone-crushing snakes are also breeding in the wild. Dumping reptiles is illegal and Florida lawmakers are currently mulling stiffer penalties, including possible jail time. The state will also hold its first “snake amnesty day” on May 6, for anyone who might want to dispose of their Burmese pythons or other members of the Boa family legally.